April is usually the month when the real enthusiasm for a trip to places like Spiti and Ladakh starts to build up. Reason behind this is very simple really. With winter season gone, roads to these remotest of all places in India start to open and the excitement slowly starts to grow. Guest Houses and Hotels become functional again; locals get ready for the tourist season ahead and BRO works rigorously to clear all road as soon as possible. Majority of the tourism in Spiti valley actually happens between the months of June and September but a lot of people visit here earlier as well. While it cannot be termed as the best time, a trip to Spiti valley in April still has its own benefits. What those are and how can you plan your trip to Spiti in April is what I will provide details on in this article. A common notion is that Spiti during winter season remains completely blocked which is not at all true. Once winter settles in and it starts to snow, it is only the road from Manali to Kaza that is declared closed. The route from Shimla to Kaza however remains open for all 12 months. Why is it this way? Reason is actually pretty simple. From Shimla, in order to reach Kaza, you do not have to cross even a single high altitude pass. Whereas, from Manali side, there are two high altitude passes, Rohtang and Kunzum, that get buried under several feet of snow due to which the road becomes inaccessible. So how do you travel to Spiti valley in April then? Well first of all you must plan your trip via Shimla only. Will you get to see snow? It really depends on the weather but chances are that yes you may find some. How will the road conditions be? To be honest, road conditions in Spiti are always bad so you not get your hopes high in that aspect. Will acute mountain sickness be a problem? In all probability no, since you will be starting from Shimla. Mountain sickness becomes a concern when the gain in altitude is sudden but in this case, you will be gradually ascending in terms of height so may not face any signs of AMS in Spiti at all. Second factor is that the places where most people suffer from AMS, like Chandratal, will not be accessible in April anyways. For more details on what AMS is and what its symptoms are, please read How to Handle Acute Mountain Sickness in Spiti. Is Spiti Valley Open in April? The answer is that yes it is definitely open. In terms of roads, almost all roads except for Manali – Kaza stretch will be accessible. Most of the guest houses and hotels become functional in April so in terms of accommodation as well, Spiti will be open in the month of April. For a brief overview on which road in Spiti remains open in which month, please read through the article below. I will begin by first laying out a sample itinerary followed by a brief explanation of the same. For the sake of this article, I will assume that you are staring from Delhi. If the point of origin for your trip is different than Delhi than only the 1st and last day of the journey will differ; rest will all remain the same. This is a sample 10 day travel but of course, not everyone can follow it to the last detail. Your final itinerary will depend on several other factors like how many days you have in hand and your mode of travel; however the layout of the trip between Narkanda to Kaza and back to Shimla will pretty much have to be the same. Following the above mentioned plan, destination for Day 1 will be Narkanda which I find much better than staying at crowded Shimla. This journey can easily be completed in about 7-8 hours depending upon your speed. On Day 2, you will start really early from Narkanda and reach Chitkul. I say early because from here on, roads will mostly be bad ; and travel time between Narkanda to Chitkul can easily be up to 8-9 hours. From Chitkul, you will reach Nako on Day 3 which again is about 8 hours of travel. Destination for Day 4 will be Mud village for which you will have to take the diversion from Attargo bridge after Dhankar. You will reach Kaza on Day 5 and explore the nearby areas on Day 6. On Day 7, you will take the long drive back to the small town of Kalpa. This will easily be about 9-10 hours of journey so ensure that you get an early start again. Sarahan will be the destination for next day after Kalpa and then you will continue back to Delhi via Shimla on Day 10. If you cannot afford all 10 days, then you can remove a few days from the itinerary to make it a short trip. Trip to Pin Valley can be removed and you can get to Kaza straight. Exploring villages of Kibber and Komik can be removed as well. From Kalpa, you can easily make it to Shimla in a day so Sarahan can also be removed while returning back. While making your own itinerary, there are a few things you must keep in mind that I will mention below. One of the biggest confusions people have while going to Spiti valley in April is about Manali to Kaza road. A lot of people think that it will be open in April but that never happens. Manali Kaza route always opens sometime towards late May. There is no way that you can travel on this road in April. You must keep it out of your travel plan unless you are planning to go after June. It will not be on the extreme side but it will still be cold enough. Day will be pleasantly warm but night will get harsh and cold. There is a great chance that you will find some snow in the valley even in the month of April. Though it will not be as much as in January of February, but it will still be enough to make you feel the chill. Chances of a snowfall too remain in Spiti valley until the month of April. Day temperature in Spiti in April will hover between 5 to 10 degrees Celsius. It will however definitely drop several degrees below zero at night; may even go as far below as -10 degrees. You will be able to find accommodation at all the places I suggested in itinerary easily. If you want to book in advance for your peace of mind, you may chose to do so; however I will not recommend it. Since it is just the beginning of the season, there will not be many tourists around and you will have no problem in negotiating an on the spot deal. If you booked in advance, you may actually end up paying more. And by late I do not mean like 10 or 11 AM but at least wait for the sun to come up. Though it is not so much but the threat of black ice still remains in the month of April as well. The freezing temperature at nights may cause black ice to form on the roads which will be a danger if you started really early. Wait for the sun to come up and start at around 8 AM so that it is a bit warm for the ice to have melted off the roads. Some locals too would have traveled by then so chances of you encountering a sheet of ice on the road and skidding will be very less. This will actually apply irrespective of your time of travel. When going to a place like Spiti valley, it is always wise to keep at least 1 day or 2 as buffer. If you got stuck at any of the places for any reason, like a landslide for example, then you will at least be able to afford it. Do not tie yourself down to a very strict travel plan. A common misconception is that Lahaul and Spiti are the same place. It is actually incorrect as both are different valleys. Spiti is the area around Kaza and Chandratal whereas Lahaul is the valley around Keylong, Jispa and Udaipur. While traveling in April, there is no way that you will be able to cover Lahaul and Spiti both as Kunzum Pass will remain closed. You will only be traveling to Spiti valley and not Lahaul. If you were not traveling by your own vehicle, you can still plan a trip to Spiti in April. There is a daily bus from Shimla to Kaza that you can board and complete the journey. For places like Chitkul and Sarahan that are off the main highway, you will easily be able to find a shared taxi. This will be the biggest drawback of visiting Spiti this time. The road to Chandratal lake in April remains blocked and there is no way that you can reach here. The only way would be to hire a local guide and porter from Kaza and trek all the way to the lake. By road, you will not be able to visit and must keep Chandratal out of your itinerary. Visiting Spiti Valley is actually a great idea unless you were thinking of chasing snow. By end of the month, weather would have gotten warmer and will be more pleasant; which would be a great benefit if you were thinking of a bike ride. Availability of hotels would too have improved greatly by end of April. If you were however hoping to find snow then April end is not a good time because snow would mostly be gone at least from the lower areas. I am adding this here because a lot of people confuse Lahaul Spiti to be the same place. Truth however is that these are two different valleys. Lahaul Valley is the area around Keylong, Jispa and Udaipur; whereas Spiti is the area around Kaza and Chandratal. In order to visit Spiti, you will have to travel from Shimla side and return the same way; which can be done in any of the weeks in April. To visit Lahaul Valley however, you will have to go via Manali and can only do it after Rohtang Pass has been declared open. The route from Shimla to Kaza remains open throughout the month so you can travel in any of the weeks. If you were traveling in early April, you may find some snow around Nako and then around Kaza. The bus service too remains operational on this route so you can even travel by public transport. The only place that you may have to keep out of your itinerary is Chitkul if the road was still blocked, but usually it too gets opened by March. You cannot do Manali to Kaza in April and it is a straight no. Rohtang Pass opens towards mid April and then Kunzum Pass towards Mid May. So the earliest you can travel on Manali Kaza highway is in the second half of May, no earlier than that. There are a few popular treks in both Spiti and nearby Kinnaur Valley that you can venture upon. I am not really much into trekking myself so cannot give much of an advice on that. A lot of trek organizers are however available in Shimla, Manali and Kaza; and depending upon your own choice, you can venture upon any of the trails. Pin Valley remains open and accessible in April. Mud Village is the most popular destination here and to get there, you will have to take the diversion from near Attargo Bridge, just after Dhankar. There are a few hotels in Mud Village (also known as Mudh Village) where you can stay in Pin. But like rest of Spiti, to get to Pin Valley, you will have to trek via Shimla and cannot take the Manali route. In terms of sightseeing, pretty much the entire region remains open with an exception of Manali Kaza route and Chandratal. Starting from Shimla, you will be able to visit all the major tourist destinations en route; including Narkanda, Sarahan, Chitkul, Kalpa. Nako, Tabo, Dhankar, Pin Valley and Kaza. You will also be able to make a trip to the local villages of Kibber, Komik, Hikkim, Langza etc near Kaza. Chitkul may sometimes get temporarily out of reach if it snowed unexpectedly on the way but chances of that happening are a bit slim in April. You will be able to drive up to Losar after Kaza but no further. Kunzum Pass, Chandratal, Batal and the entire Manali Kaza road would have to be left out. It also means that you will not be able to visit Rohtang Pass as well. Starting from Delhi, the highway until Chandigarh is super smooth. Between Chandigarh and Shimla, there are a few bad stretches due to road widening work that is currently going on but apart from that, the road is good actually. From Shimla to Narkanda and Rampur, road will be smooth enough however will start to deteriorate after that. After Jeori, it will start to turn in to a nightmare and the worst patch will be between Reckong Peo and Pooh. From Peo to Nako, the road is actually quite good, and then will be a mix of average and bad between Nako and Kaza. The stretch between Karchham and Chitkul is quite bad and broken. Road towards Mud Village is a dirt trail but not that bad and OK to drive on. Kibber, Komik, Langza and Hikkim are all remote villages and roads to these villages are completely dirt trails. It will really depend on how you are traveling and which part of the month. If you were planning a bike ride then you need to really windproof yourself, from head to toe. The beginning of April will have you riding through some icy cold winds and you need to be prepared for it. Some good quality thermals, followed by cottons, light woolens and a heavy windproof jacket is a must for you. When you buy gloves, make sure that you test them and there is no wind getting in from anywhere. If you were traveling by a car, then you need to pack clothes in layers. When I say layers, I mean clothes that can be worn on top of one another. The weather of Spiti can be a bit tricky and unpredictable. You will be feeling cold standing in the shade and feeling hot while standing in the sun, at the same time. So you need to pack clothes that you can either put on or remove in layers as per your comfort. A heavy windproof and warm jacket is a must in case of a drive as well. Make sure that your jacket also has a hood to protect your head and neck. Which then brings us to our next question. Should you plan your trip by car or motorcycle? This is really a personal choice and both are OK. A lot of people visit Spiti in April both by car and motorcycle. Your just need to decide which one works better for you and plan accordingly. However you come though, the most important thing to remember is to get your vehicles ready. Mechanics in Spiti are scarce and since April is still the beginning of tourist season, you may not find too many mechanics around. Even a small problem can really upset your plans and cause great pains here. 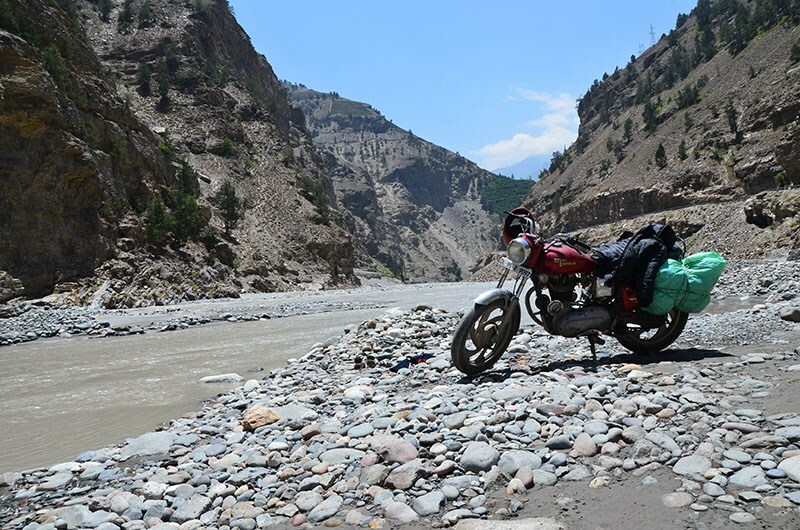 A trip to Spiti is going to be challenging not just for you but your vehicle as well. Get it serviced well in advanced and then ride / drive around for a week before the trip to ensure that everything is working fine. Repair or remove anything that seems dicey. Take a look at the articles below to read in details on how to prepare your vehicle and what spares to bring. Until Reckong Peo, you will keep coming across several towns where mechanics are available. Once you cross Reckong Peo, the next mechanic will only be available in Kaza. At all these places though, you can only to get some minor fixes done. For any major problem, you will have to bring your vehicle back to Shimla. Like Mechanics, Petrol pumps too will be available at regular intervals until Reckong Peo. After Peo, the next gas station is in Kaza only which remains operational in April. This may be a challenge if you were traveling in first few days of April. Temperature at this time can still be close to zero degrees which freezes water everywhere, even in the pipes. This means that there may not be any running water in towns in Spiti. Hot water will be provided in buckets which you will have to use conservatively. And yes, this also means that you may have to go without a shower for a few days. If that is something that you cannot live with, maybe you should plan towards end of April rather. This could be another challenge in first few days of the month. If the temperature was still close to 0 and running water was still scarce, it means that there will not be any water available in toilets as well. If that happened then you will have to do your morning business squatting over a dry pit. Will you get to see any snow? It is hard to predict to be honest and depends entirely on the weather.If you went early in the month than you will definitely find snow on the ground. This will however be limited to area around Kaza only. Snow around Shimla and Kinnaur valley is mostly all gone by April. As the month progresses, the remaining snow in Spiti as well starts to vanish fast. So if snow is what you are after, then ensure that you are traveling in first few days of the month. If you were lucky and weather favored, you may even catch a live snowfall in Spiti valley in April. In fact I have witnessed a snowfall in Narkanda itself in first week of April. And that mostly is all that you need to know about visiting Spiti Valley in April. Keep the above mentioned things in mind and I am sure you will have a great trip. I hope the information above was of help. If you have any further questions, please feel free to ask in the comments section below; or at our Community Forum; and I will be glad to answer. Your blogs are awesome! I am travelling with 4 of my friends from Delhi on 27th April and will start journey around 3AM. Our flights back to Mumbai are on 4th May Morning 6 AM. Despite having less days in hand would like travel kaza around bit. Is pin valley, mud villages are worth to see in this short trip? If yes, how to accommodate those places in plan (like while going or coming back from Kaza)? I guess we can pas Narkanda on first day by afternoon so can stay at Rampur. Is there any budget hotel at Rampur? Hi Suraj – You can plan a short trip to Pin Valley while going to Kaza, it won’t take more than 2 – 3 hours at most. And yes, there are several budget hotels in Rampur. Just a last question, in April end weather forecast still saying there will be chances of snow and temperature will be surely go down below zero. We are taking Tata Nexon automatic disel version. Will that vehicle be needed for antifreezing agent for fuel or there is no need? Also in April end season, most of hotels will be starting though is it advisable to book it online with whatever choices are available or we can go directly? Thanks alot for your help! It means alot! No there will not any problem of Diesel freezing in April. It usually happens in January and February only. And no, need to book in advance as well. You will easily get a hotel on the spot in April end. Me and my wife planning to visit spiti in end of april. Which is easy mode of travel . Should we hire bike from shimla or travel by private taxi? I have done leh-nubra-pangong-leh last year on rented bike. It is entirely your personal choice Hardik Bhai. If you have done Ladakh on bike then you can do Spiti as well but with your wife being with you, I would recommend traveling by a taxi instead. Rented bikes in Shimla may not be that reliable and you do not want one breaking down on you in the middle of nowhere with your wife next to you. Thank you for the very informative Blog. Do you think i can find snow on the ground around Kaza? If not in Kaza, do you think i can find any near Kibber Village? If not Kibber, can i take the road ahead from Kaza and go towards heights to find snow. I will be renting a car from Kaza i guess, when there. Thanks In advance. Hi Praveen Ji – Chances of finding snow on the ground are next to none at this time. thank you so much, appreciate all the help. Your blog helped us a lot while planning our trip for Spiti. I just want to ask a few questions regarding our trip. We’re following this route: Delhi – Narkanda – Sangla / Chitkul – Nako – Kaza – Mudh – Kalpa – Shimla / Chail – Delhi. We’re going in the first week of April, so will we find any snow up there? Also, due to some unforeseen circumstances one our friend whose car we were taking won’t be able to make it. So, do you know any driver who can take us though this whole trip and what kind of budget will it be? Snow – Not on the ground. You may find around Chitkul though. For taxi, I don’t know anyone in Delhi but can give you a name from Chandigarh or Shimla. If you can give the contact of one from Shimla that would be nice. We are 7 people planning to visit spiti valley in 2nd week of April. my question is can we get snow on the way in this time? ?we enter Spiti via Shimla-Kaza road. then narkanda, nako,tabo, Sarhan,chitkul, Komic village etc. please help me with this. There won’t be any snow left by April 2nd week Soumik. You may find some towards Chitkul if you were lucky. Am Mustafa here. We are from Bangalore & are planning to visit Spiti in the first week of April next month. Need to know where we should fly to & how can we get self driven car from there. Your reply asap will be highly appreciated. Hi Mustafa – You can fly to Chandigarh and book a Zoomcar from there. Hey! I’m planning for a road trip to Spiti around the last week of April, say leaving Delhi on 22nd and spending like 3-4 days in Kaza. What do you think will be the weather conditions at that time? I am also travelling in same week from Delhi.about temperature and my words with the people there its expected -15near to. I will be reaching Leh by 15th April and leaving Leh by 20th and how do I visit Spiti after that as the Manali roads would be closed and which is the alternative road I should take and how many days would it take to reach Spiti from Leh and how many days would it take to visit Spiti and get back . As I should be reaching Bangalore by 3rd may. Please help me with this . Hi Bharcy – How are you leaving Leh on 20th? By road or flight?